What's happy, sad, united, and mad; yet at the same time separated and together in tandem? What's that? A squirrel playing the banjo? Are you crazy? Just like the plonkers in this 67 minute documentary made in 2010, celebrating the partnership of two British chaps that like to play silly buggers? What again? Yes you are? Oh! Fair enough. No problem there then. 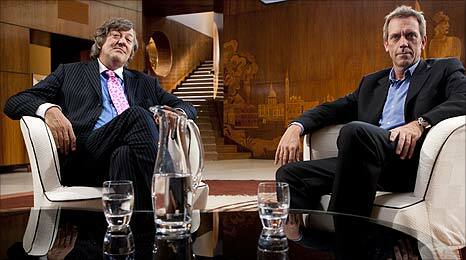 It has been thirty years since the comedy partnership of Stephen Fry and Hugh Laurie first met. And for the last fifteen of those years, they've both been doing other things elsewhere. For example: Stephen has kept himself busy hosting the popular panel show, 'Q.I. ', and producing documentaries on mental illness plus other topics of note. Where as Hugh's been appearing in the hit American medial-drama, called 'House', and starred in an episode of 'The Bill' too. Still, this is nothing more than back-story within the scheme of things. Right, dear readers? What we want to know is how the following people think about Stephen Fry and Hugh Laurie's time together on screen! Alison Steadman -- 'Don't ask me! I was just hired to narrate this sh*t'. Jo Brand -- 'Can I have some cake? I'm bloody hungry'. Jack Dee -- 'Stephen Fry is like my old head master. Gay and funny'. Charlie Higson -- 'I'm flattered to think they thought me and Paul were their funny plasterers'. Jools Holland -- 'Hugh is an amazing pianist. Shame he can't act, ha!'. Ben Miller -- 'They pinched my act before I even thought of it'. Jon Plowman -- 'They've both grown from very talented young men, to very talented old men'. Caroline Quentin -- 'I felt really out of my depth working with them'. Daniel Radcliffe -- 'Highly intelligent. Extremely ridiculous'. Jan Ravens -- 'Hugh wanted to be Clint Eastwood, and now he is'. Tony Slattery -- 'My time with them was lovely'. Emma Thompson -- 'They were destined to be friends'. Paul Whitehouse -- 'They didn't inspire me at all'. Stephen Fry -- 'As a gay man, I'm happy to say that I've never fancied Hugh'. Hugh Laurie -- 'Stephen and I got on straight away. I think'. Ahh! Isn't that lovely? The way that these silly b*stards remember Stephen and Hugh. Granted, not lovely like Stephen being arrested when he was 18 years old for credit card fraud. Or Hugh contemplating being a Honk Kong policeman at an early age either! But lovely like how these two friends first met at the Cambridge Footlights, and how they took their review show to the Edinburgh fringe, winning awards, and a spotlight that thrust them to sit in a room thirty years later, and talk about their past triumphs together. Such as: (1) How their first two show's for the BBC -- 'Alfresco' and 'The Crystal Cube' -- were a commercial failure. (2) How working on 'Saturday Night Live' gave them a bit of 'street cred'. (3) Their jovial time on 'Blackadder'. (4) What it was like living together in a house they owned in Dalston. (5) How 'A Bit Of Fry And Laurie' freed them up to do what they always wanted to do. (6) 'Jeeves and Wooster'. And (6) Their future. 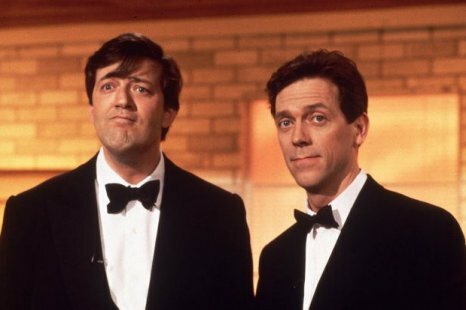 Now like many of the other great comedians I've admired in my time, I'm not really sure when I first saw Stephen Fry and Hugh Laurie on screen together. OK, most probably it was on 'A Bit of Fry and Laurie'. Or even an episode of 'Saturday Night Live'. Although, for the life of me, I'm hundred percent positive that it wasn't on 'Jeeves and Wooster'. Yes. That is correct. I quite a big fan of this great British double-act: Here, check out these facts for a glimpse of my nerdy ways: (1) Not only did Fry and Laurie appear in one of my favorite episodes of the 'Young Ones' -- entitled 'Bambi' [click here for what I am referring too] -- but they also appeared in the follow-on series, 'Filthy Rich & Catflap'. (2) Now for some strange reason this double-act appeared in Rowan Atkinson's historical opus -- 'Black Adder' -- in a very incremental manner. On the second series: Stephen had the recurring role of 'Lord Melchett', whilst Hugh made an appearance as the dastardly 'Prince Ludwig'. On the third series: Hugh had a recurring role of 'The Prince Regent', whilst Stephen made an appearance as 'The Duke of Wellington'. But finally, on the forth series: they both had recurring role's with 'Lieutenant George' for Hugh, and 'General Melchett' for Stephen. Oh! And of course, there was the 'Sky Special', right? But I think that's best left alone, ha! (3) Their homage to the P.G. Wodehouse novels -- 'Jeeves and Wooster' -- ran for four series from 1990 to 1993, and received quite a bit of critical acclaim in the process. (4) Hugh and Stephen made John Cleese cry at the 1987 'Secret Policeman's Ball', when they abused him whilst giving him an award on stage. It was fake crying of course. (5) In an episode of the 1989 Rik Mayall political sit-com, 'The New Statesman' -- entitled 'The Haltemprice Bunker' -- both Stephen and Hugh took opposite stances in this satirical story. Stephen was an abusive businessman, whilst Hugh was an abused waiter. (6) To date, this comedy partnership has only appeared in two films together. Firstly, the Kenneth Branagh 1992 rom-com, 'Peter's Friends'. And secondly, in the 1997 Spice Girls movie, 'SpiceWorld'. Also, on a side note, they've only appeared on two radio programs together too -- 'Saturday Night Fry', and 'Whose Line Is It Anyway?' -- both for BBC Radio 4 and in 1988. (7) Their skit show -- 'A Bit of Fry & Laurie' -- ran from 1989 to 1995, entailing four series, and was loosely based on the format of such shows as: 'The Two Ronnies', 'Not Only But Also', and 'Monty Python's Flying Circus'. Oh, Bugger! I rambled on too much there, haven't I? Still, I suppose this just goes to show how much they've made an impression on me over the years. You see, when I was about nine or ten years old, I just loved those little 'vox populi' skits they did on their show. So me being the silly sausage that I was -- still am as a matter of fact -- I thought that this type of thing must be an easy thing to do. However, I forgot about one main logical principle in hindsight. Stephen and Hugh were professionals, where as me sticking a camera into some strangers face and asking them to 'say something stupid', wasn't. Ha! Live and learn, right? Live and learn. And in many ways this pithy phrase sums up what I thought about 'Fry and Laurie Reunited'. OK, I have to admit, it wasn't the most in-depth piece of documentary film-making I've ever seen. Though, what it was; was a nice snap-shot of a journey two very diverse men took to get to where they are today. Now my own personal favorite sections in this piece, was when Stephen and Hugh talked to each other in that pre-fabricated studio. It just illustrated to me that the main reason why they worked so well together, was because they actually liked each other. Also, that no matter what they did on screen that contradicted this fact -- like Stephen hitting Hugh in a skit for instance -- wasn't meant in malice at all. Isn't that correct, YouTube video clip? Now I can't top that now, can I? Great documentary - great comedians - silly review.